In order to reap the greatest benefit from your Tower Silo, it must be used properly. The material and information in this manual has been gathered from universities and qualified individuals and is therefore, deemed reliable. How to properly and safely use a Tower Silo is the goal of this publication. Note: The material and information contained in this manual is general in nature and is therefore not guaranteed. The use of the information is subject to the limitations of good management, weather and other conditions present at the individual location. Please read the opening statement located at the bottom of the first page for a more precise explanation. A brief sampling of the manual is presented for your review. ALL farmers who own tower silos should always have a copy on hand. 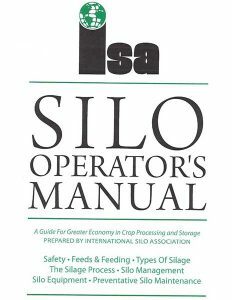 For more information about the proper operation of a Tower Silo or to purchase a copy of the manual, please contact your local Tower Silo Company or the ISA Directly.